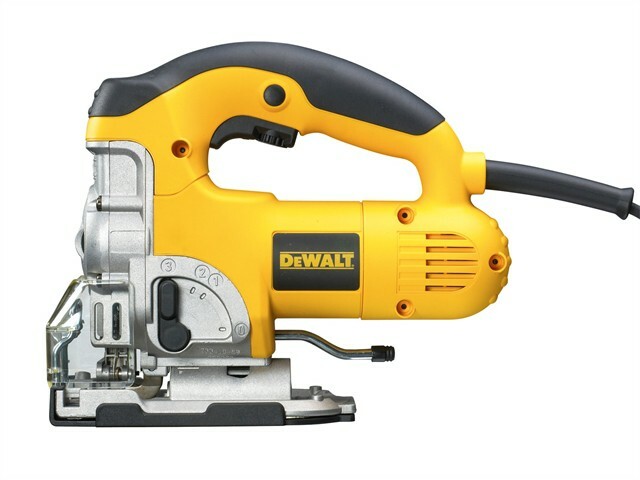 The DEWALT DW331K Heavy-Duty Jigsaw has a rugged motor and full variable speed control, delivering fast cutting action of up to 3,100/min. With a tapered saw blade roller that controls the blade deflection at maximum depth of cut. With a 4-position pendulum action that controls the aggressiveness or smoothness of cuts. Fitted with full wave electronic speed control with feedback that ensures the blade speed is maintained under any load, for a consistent finish across all materials. The patented anti-vibration counterbalance mechanism and rubber grip provide smooth operation and reduced fatigue over long periods. The quick and easy patented keyless blade change system accepts T- shank blades and a tool free adjustable shoe. That has an anti scratch cover, capable of bevels up to 45° in both directions. Its modular component design provides trouble free servicing and there is a switchable dust blower that keeps the cut line clear and free from debris. Strokes at No Load: 0-3,100/min. Stroke Length: 26mm, Bevel Capacity: 45°. Capacity: Wood: 130mm, Steel: 12mm, Non Ferrous Metal: 30mm.